Meningitis is a deadly disease that causes massive damage to the human brain. Young children are most in danger. West Africa has seasonal epidemics, the worst of which was in 1996/1997 when, according to the WHO, 250,000 people were affected and 25,000 died. The latest research suggests that meningitis occurrences increase in winter, when hot dry winds blow strongly from the north. The disease can be caused by bacteria, viruses, or parasites and is therefore an infection in most cases. Non-infectious and asymptomatic meningitis cases are relatively rare. meningitis cases among older children and adults. MCM has an extremely high mortality rate if it remains untreated. possible to link reported MCM cases with weather conditions in the Sahelo-Sudanian band. The spatial distribution of the disease across this part of Africa is commonly referred to as the ‘Meningitis Belt’. 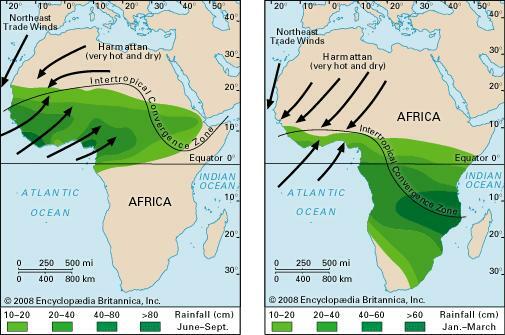 Sahara desert known as the Harmattan (Figure 2), followed by a monsoonal wet season. Although the biological mechanisms involved are not yet very well understood, scientific investigations (e.g. by Greenwood et al., 1984 and Cheesbrough et al., 1995) have established a strong correlation between the Harmattan winds and the spread of MCM cases in West Africa. 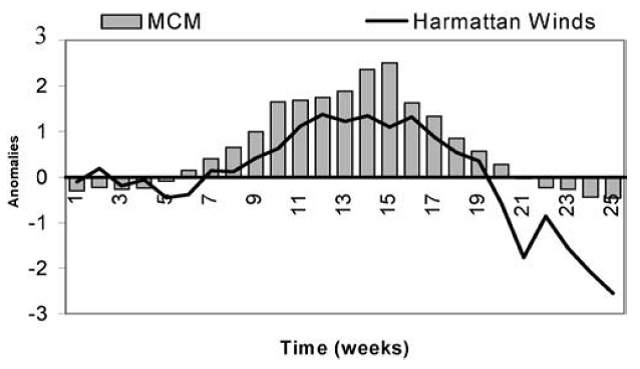 Figure 4 shows a mean weekly Harmattan wind index plotted together with the number of MCM cases during the period from 1994 until 2002 in Mali. This index is obtained by principal component analysis (PCA) of weekly mean values of the near surface wind field. The similarity between the patterns of the two variables is very clear. 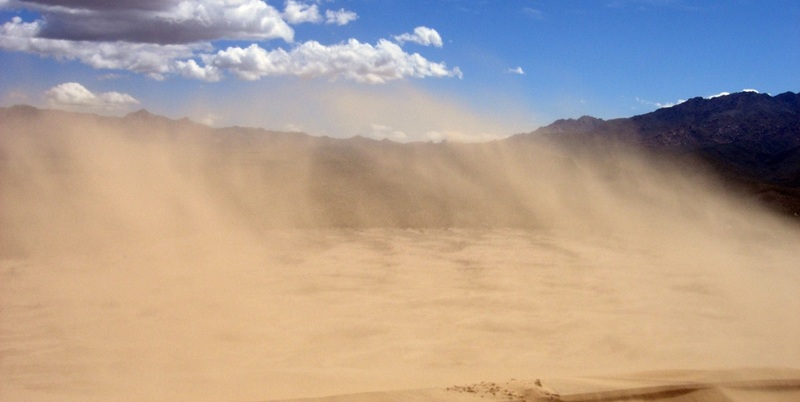 The very dry hot winds during the winter may damage the mucosal membranes, with large quantities of aerosols, especially dust, amplifying this effect. Without the protection provided by healthy mucosal membranes there will be an increase in infection rates for Neisseria meningitides bacteria. As soon as the moisture levels increase again, the immune defences provided by the membranes will reactivate and infection rates will fall. High wind speeds combined with the load of aerosol and dust particles may enhance the propagation of bacteria through airborne transmission of the disease. By that the total quantity of bacteria transported and the potential traveling distance of pathogens may be increased. Increased humidity and rain droplets would then tend to bind aerosol particles together and prevent any further spread of the disease. Whatever the correct explanation may be, the possibility exists to use this correlation to help the local population combat the disease. Spreading simple messages such as ‘Strong winds in winter are dangerous for human health’ in affected countries would increase awareness, which is an important first step in reducing the number of deaths. Once the relationship between climatic conditions and the evolution of the disease are well understood it may be possible to use seasonal weather forecasting models as a very simple but powerful early warning system. Governments will then be able to activate precautionary measures such as increasing the production and distribution of antibiotics, hiring temporary health workers, and keeping the population informed. 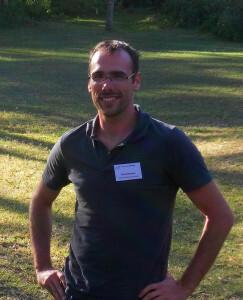 Currently a PhD student at the Potsdam Institute for Climate Impact Research (PIK) in Germany. Beforehand studied geophysics at the University of Jena and Worked for 3 years at the National Weather Service in Germany. Right now part of the project InfectControl2020 with a focus on analysing fast spreading paths (airplanes) of infectious diseases. Tagged Climate, East Africa Summer School, Infectious Disease, Meningitis, Sub-Saharan Africa.